Time saver: Summer’s on its way, cool down with a refreshing sorbet. This is a variation on the classic lemon sorbet. 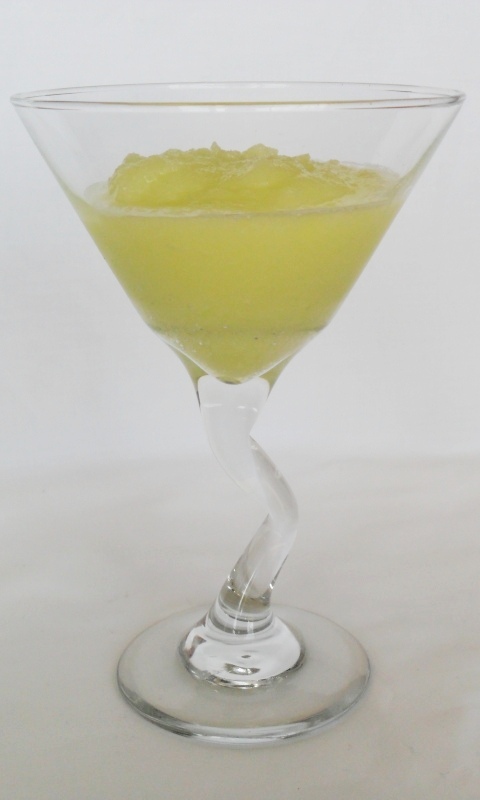 The sweet melon flavour of the Midori complements the tartness of the lemons, while also adding a little colour. Although I’ve used Midori, you can probably get away with any of your favourite liqueurs/spirits. Your freezer needs to be quite cold when making sorbet (or you’ll have to wait a long time for it to freeze). If you leave the sorbet too long without beating it (particularly before the first round of beating) the syrup may freeze solid. if that happens, just leave it to thaw for a few minutes, then beat and return to the freezer. If well beaten, this recipe makes just shy of 1 litre. Combine water and sugar in a small saucepan, heat on a hot element, stirring frequently until sugar is dissolved. Let it come to the boil, and simmer for two minutes, then remove from the heat. While the syrup cools, juice the lemons. Strain the juice through a sieve into the saucepan of syrup, add the Midori, and mix well. Leave to freeze for a couple of hours, then retrieve the bowl and beat with electric beaters/stick mix. After beating, return to the freezer. Repeat the beating process a couple more times, with hour long intervals. The more you beat it, the lighter and smoother the sorbet. Serve in chilled glasses. 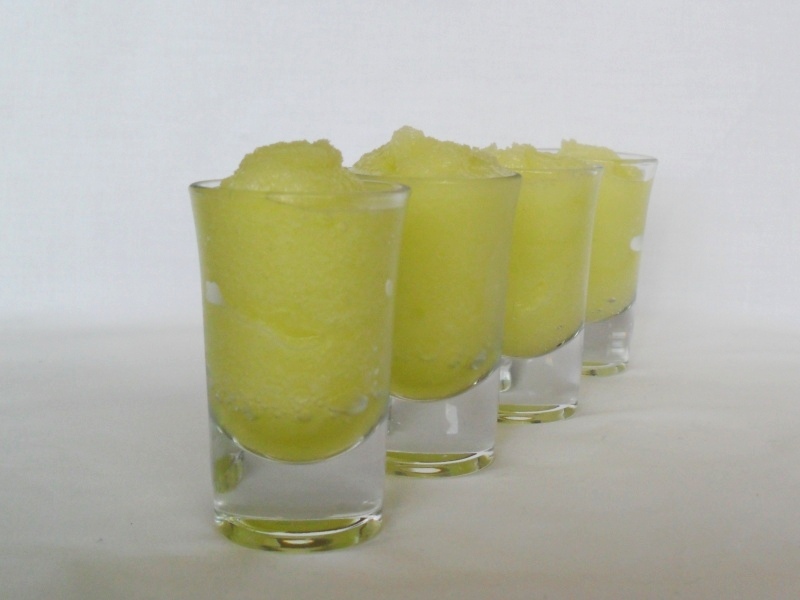 For a palate cleanser, use 40ml shot glasses, for dessert use larger chilled martini glasses. This gives two lunch sized main servings. For entrée sized servings, use the same amount but distribute between four plates. Toast pine nuts in a small frying pan over a medium-high heat – stir or shake the pan frequently to cook evenly. Once browned, remove from heat and transfer pine nuts to a small bowl/plate and set aside. Divide the salad greens between two plates, piling them into the centre of the plates. Heat a large (ish) frying pan over a medium-high heat. Transfer haloumi to a standby plate, then assemble the meal as follows. 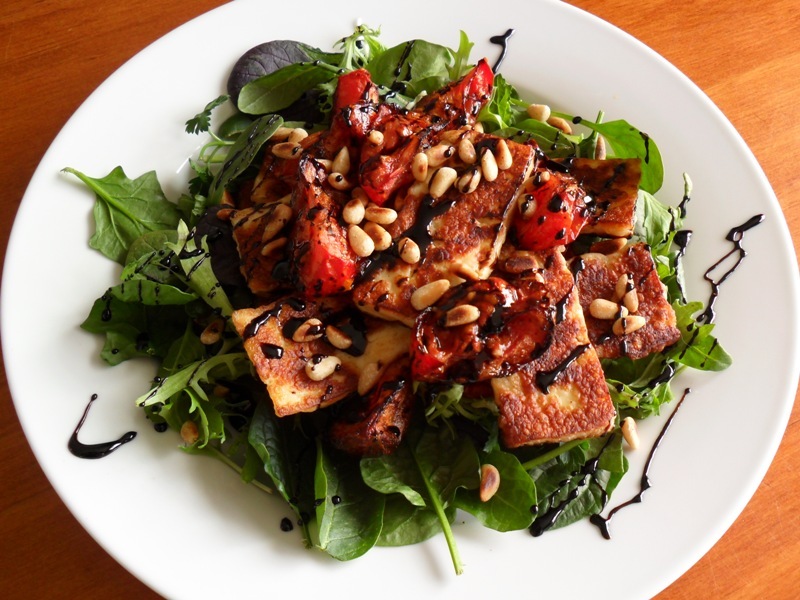 Place around half the tomatoes on top of the plated salad, then arrange the fried haloumi on top of it. 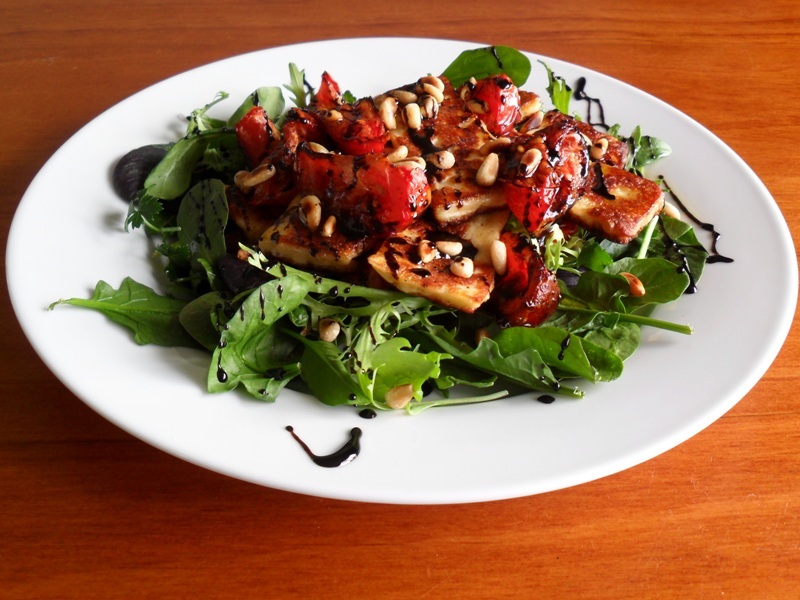 Distribute the remaining tomatoes on top of the haloumi. Sprinkle each plate with 1 Tbsp each of the toasted pine nuts. Using a teaspoon, drizzle balsamic reduction over the tops of the salads, going side to side across the plate in a weave pattern. Then turn the plate 90 degress and drizzle 1 Tbsp of extra virgin olive oil on to each salad, again in a side to side weave pattern. Then serve. These tomatoes have an intense flavour and are great as part of an antipasto platter or in a salad. Mum taught me how to make these. I’m not sure if she got them off a recipe or made it up herself, but I’ve come up with the measurements below and they seem to work. Note that you can use all sorts of different tomatoes when making these, you may need to adjust the cooking time down if using really small tomatoes, but the basic principle will be the same. Cut tomatoes into segments. If large, cut into sixths or eighths, if smaller, cut into halves or quarters. 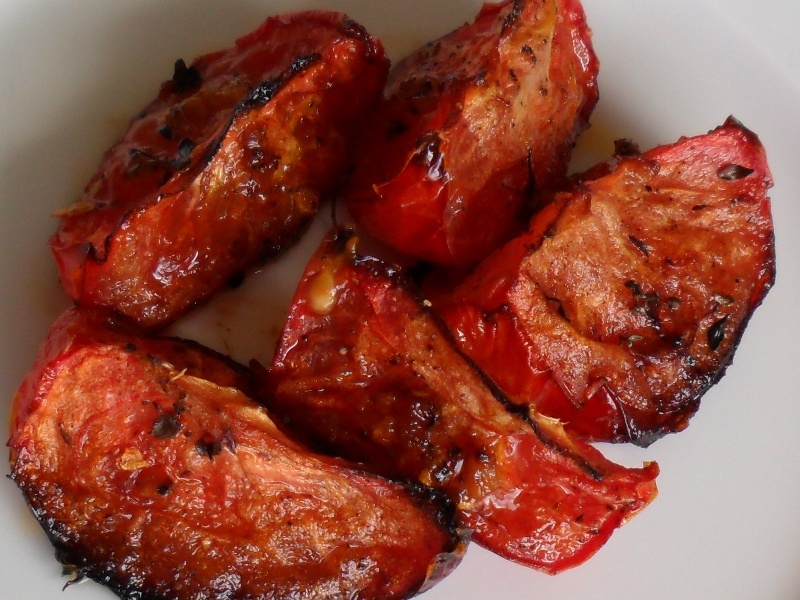 Arrange tomatoes skin down (cut sides up) in a small roasting pan (optionally lined with baking paper). Distribute the garlic evenly among the tomatoes, dropping a little bit onto each one with a teaspoon. Be sure to get some on every piece of tomato. 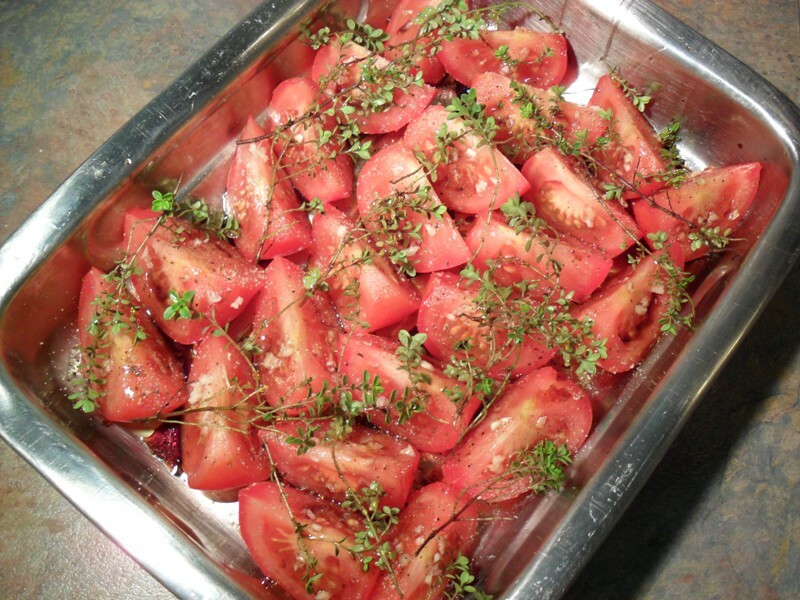 Lay sprigs of thyme across the tops of the tomatoes, again, ensure that all tomatoes come into contact with the thyme. Alternatively, if using dried thyme, sprinkle evenly over the tomatoes. Gently drizzle the olive oil over the tomatoes, then do the same with the balsamic vinegar. Remove from the oven and set aside to cool, then remove the sprigs of thyme from the top, transfer the tomatoes to a serving dish and serve. Time saver: prawns are so hot right now. 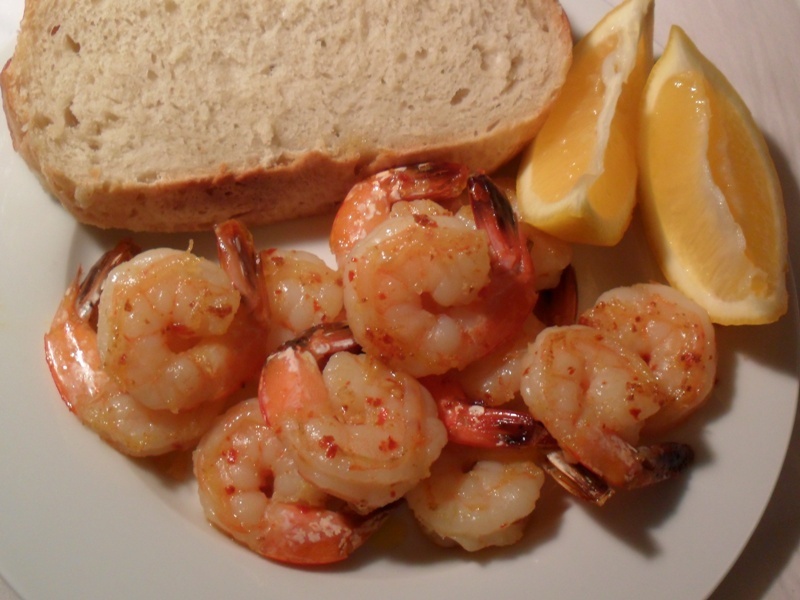 When we last visited Waiheke my aunt made us these delicous prawns for lunch. (Along with a bunch of other stuff, we were spoiled.) I asked her how she’d made them and I’ve been copying her ever since. I didn’t get an exact recipe, but the ingredients and method are hers (just not sure about quantities). Raw prawns work best, but if you can’t get them/find them then you can get away with pre-cooked ones. I take the easy option and use shelled, de-veined prawn cutlets. If you want to do all the hard work yourself you can buy whole prawns. Just be sure to remove everything but the tail, and don’t forget to slice down the middles of the backs to remove the vein. Feel free to alter the quantities to suit – the recipe scales well. Besides lunches you can also serve these as a tapas style appetiser. Heat frying pan on high heat. Add oil, and heat briefly, then add garlic, stir and cook for a few seconds. Add prawns to the frying pan and sprinkle chilli flakes over, then cook, stirring frequently. Season with salt, then serve with lemon wedges and bread. 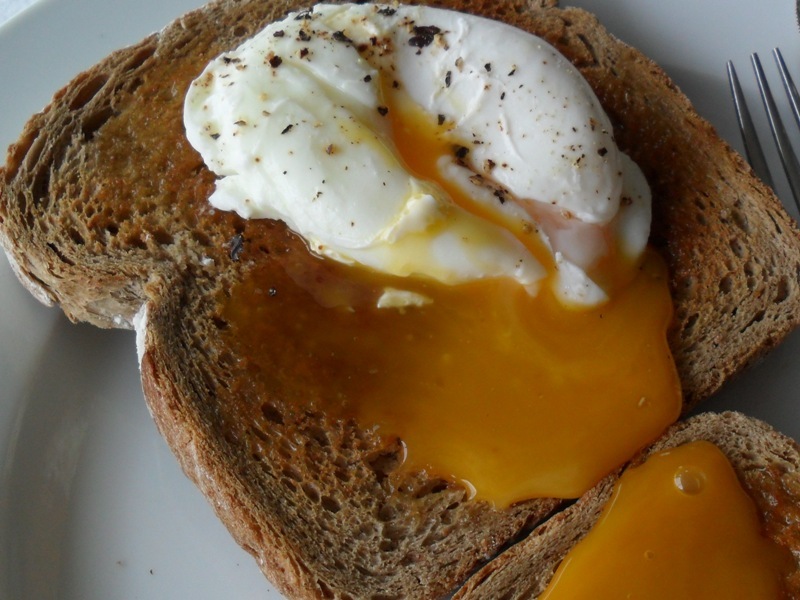 Time saver: Phil tries out the different methods of poaching eggs, and finds a clear winner. It’s been a while between posts, but I’ve been busy trying things out. (Coming soon: calamari, beer battered-anything, braised beef casserole, and more.) Anyway, this is another recipe for my weekend brunch collection. If you like a poached egg you already know the attraction. The hot buttered toast, the delicate poached egg with that rich flowing yolk, topped with a sprinkling of freshly cracked black pepper. Oh yes. And then there’s eggs benedict (my personal favourite), an english muffin, a layer of smoked salmon or bacon, the poached egg, covered in a smooth dome of creamy hollandaise sauce. Poaching eggs is one of those things that sounds simple in principle, but doesn’t always work out that way in practice. An egg, a pot of water, how hard can it be? Well, if you’ve ever tried it and had an egg completely disintegrate on you, or turn into a disappointing whispy vapour, or been left with nothing but a hard little ball of yolk you already know. Sometimes it works just fine, but the eggs still come out looking not quite right. the simple, heat water in a pan, add some vinegar, crack the egg in and hope it stays together. It sometimes works – you need really fresh eggs and a good bit of luck. Even then the eggs spread quite a lot, but the result isn’t too bad. the “use salt”/”vinegar tastes gross” approach. 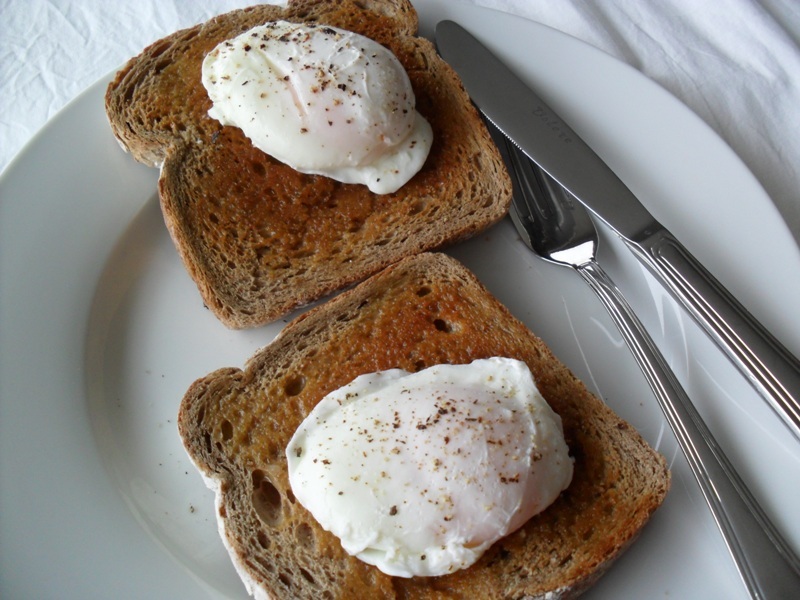 Don’t use salt, it weakens the egg white and far from helping will actually make it harder to get a good poached egg. Besides, I like the faint taste of vinegar on the egg (if you really don’t, you’re better off using nothing rather than salt – or maybe try lemon juice). the deep pan/pot approach. This actually works quite well – you heat a lot of water up in a deep pot to the point just before it boils, add vinegar, then crack your egg into a dish and slide into the pot. Again you need fresh eggs, but following this approach I’d get about 3 out of every 4 eggs turning out fine. the egg-poacher – I used to use our one a lot, since it took a lot of the stress out – essentially it’s a double boiler setup, each egg sits in its own little cup that’s suspended over a pan of boiling water. The drawbacks are probably in the taste/texture – it’s a bit more like a hard-boiled egg than a poached one. the “Julia Child” approach. You heat the water in the pot/pan to almost boiling, then drop each of the eggs in for 10 seconds (still in their shells), remove them then crack into a dish and slide into the pot. Unlike the other techniques your eggs don’t have to be fresh (I’ve used 3 week old eggs and had great results) and you get a reliably good poached egg. We have a winner. I haven’t actually seen Julia Child’s poached egg recipe – so it was all hearsay – but I tried out her technique, and I can heartily recommend it. If you’re having trouble getting the eggs to stick together, if you don’t have perfectly fresh eggs, or if you’ve never even tried poaching eggs before, this is the way to do it. Heat plenty of water in a saucepan/stock pot/deep skillet – around 10cm (4″) deep – until it’s just about boiling (you can use water as little as 4cm deep, but I find I get better shaped eggs with deeper water). Reduce the heat so the water never actually boils (i.e. there should be little air bubbles on the bottom, but it shouldn’t actually simmer). Cook the eggs in the water for around 2-3 minutes (2 for a nice runny yolk). Transfer each egg to a piece of hot buttered toast, then season with salt and freshly cracked black pepper.